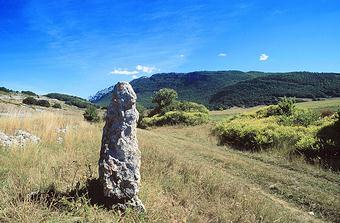 On the northeastern side of the Rovere's Plain, in Abruzzo (Central Italy), lies this enigmatic standing stone, 1.7m (5.5ft) high above ground. It is locally known as Lu Termine, which means The Landmark; it was probably used to mark the border between the ancient populations of Marsi and Vestini. The stone is triangular in shape: one of its edges points clearly East. Located 20cm (7.8in) from the top, on the two faces forming the edge of the stone, are two carved circles 9cm (3.5in) in diameter. The most regular and visible of the two rings shows two very little cupmarks. Near this circle, on the edge, there is a protrusion; this and the carved ring resemble an eye and a nose, giving the stone a curious anthropomorphic look. Nearby there is also an 18m (59ft) long stone row, running North-West. In the Eighties, a group of amateur archaeologists from Pescara was doing some research around the stone; when a shepherd saw them, he began to scream, threatening them with his stick. Then he ran to the village saying that some people were trying to move Lu Termine. This shows how the stone is still respected in local tradition. At the base of the pillar the archaeo volunteers found part of a haversack strap, 5 bullets, and a cartridge case from a German rifle. These findings and the fact that the stone top broke in recent times (there are no signs of oxidation), may suggest that Lu Termine had been used as a shooting-target during the Second World War.